What would you do with an extra $120? I would use it for a special date night with my husband, since we will be celebrating our 13th wedding anniversary next week! 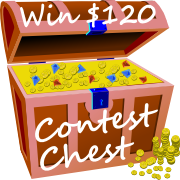 How would you like to win $120 cash? To sweeten the deal, for sharing this giveaway with my readers, I could win too! That's right, if the winner entered the giveaway through my blog, I win too! How cool is that?